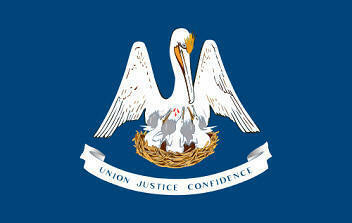 The dark blue State Flag of Louisiana features the iconic pelican feeding her three chicks over a white banner with the words Union, Justice and Confidence, the stat's motto. It serves as a symbol of honor, heritage and regional pride and is displayed at state buildings. There is a strict Order of Precedence for flags. State Flags are displayed in order as they entered the Union. Car Flags are often displayed to represent of an individual's allegiance to their state. Louisiana State car flags are used by their owners as mobile emblems of their home. Car flags are usually made from strong materials and are attached to a car via a pole and clip window attachment. What is the design of the Louisiana state flag? The image on the seal depicts a pelican feeding her nest of three chicks. Beneath the picture of the pelican is the state motto of "Union, justice, and confidence"
What does the pelican symbolize? What is the history of the Louisiana State Flag? 1769 Spanish Governor Alejandro O'Reilly finally established firm control of Louisiana for Spain which then flew the Bourbon Spanish flag. 1810: West Florida Lone Star adopted by American citizens in the area of present day Louisiana known as the Florida Parishes. 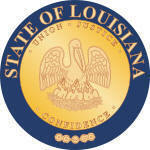 1812: Louisiana formally became the 18th state to join the union. 1861: Independent Louisiana after seceding from the Union and before joining the Confederacy, Louisiana flew the flag of an independent nation for 2 months. for all of those abiding here." The Louisiana state flag is kept and used as required by the code specified in the constitution of the state. Louisiana Official Nickname "Pelican State"